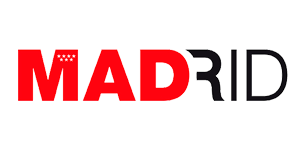 In the beginning of 1937, Madrid, which had remained loyal to the Republic, was practically surrounded by the rebel army. Almost all of the roads leading to the capital were under his control, except for the Valencia road, which was the supply route to the capital. In this situation, the Francoist High Command plans an enveloping manoeuvre over the city, with the intention of cutting the road from Valencia and reaching Alcalá de Henares, definitively isolating the capital, in order to force its surrender. 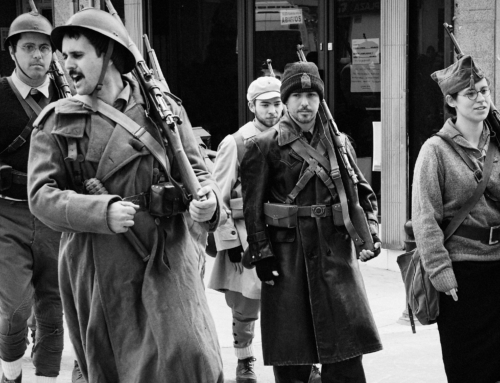 At the end of January the start of the offensive was considered, but the bad weather has slowed it down. The good weather arrives on February 5th and on February 6th the operations begin. An army of some 18,000 men commanded by generals Varela and Orgaz starts from Pinto and Valdemoro, taking Ciempozuelos, San Martín de la Vega, Gózquez de Arriba, Gózquez de Abajo and La Marañosa, reaching on the 8th the heights that dominate the Jarama river. Again the bad weather returns and the rains paralyse the offensive line. Republican reinforcements begin to arrive at the front, establishing a strong contingent of troops defending the Arganda Bridge area, thinking that the Franco offensive would take the shortest direction towards Madrid. Early in the morning of 11 February, hostilities begin again. The I Tabor of Ifni Shooters, takes the so-called Pindoque Bridge by surprise. The second part of the offensive begins with the passage of the river. 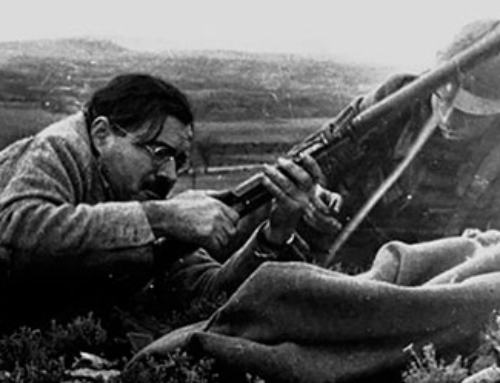 The Third National Brigade, under the command of Colonel Barrón, is going to launch itself towards the conquest of the heights of the vertices Pajares and Valdeperdices, although the republican resistance is beginning to make the advance of Franco’s troops very difficult. In the early morning of the 12th, another bolt jumps again over the Jarama. 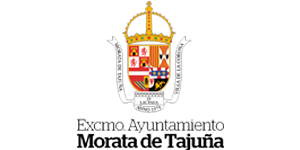 On this occasion, it is the III Tabor de Regulares de Tetuán which takes the bridge that joins the San Martín de la Vega road with Morata, which was defended by a company of the 17th Mixed Brigade. The II and the IV National Brigades commanded by the colonels Saénz de Buruaga and Asensio Cabanillas are launched towards Morata ascending to the plains that separate the valleys of Tajuña and Jarama, with the so-called “Army of Africa” in vanguard (Tabores de Regulares and Flags of the Legion). 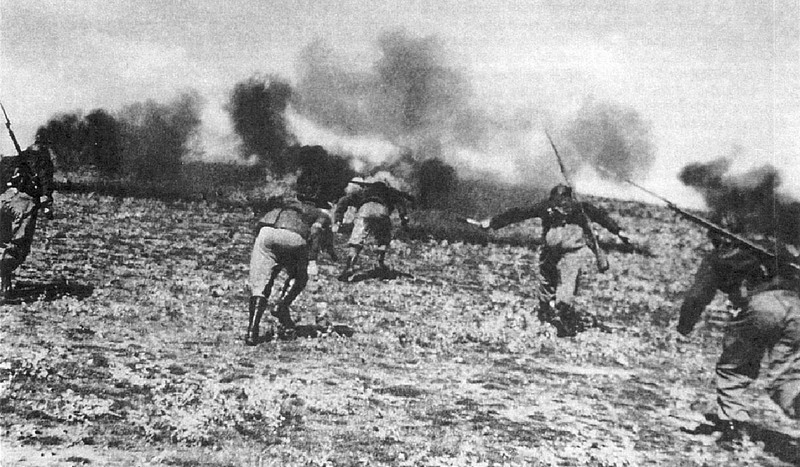 Opposite Morata they meet with the XI and XV International Brigades, producing a very hard conflict between the two armies in the olive groves that surround the Galiana Way. The Republican units manage to stop the offensive. 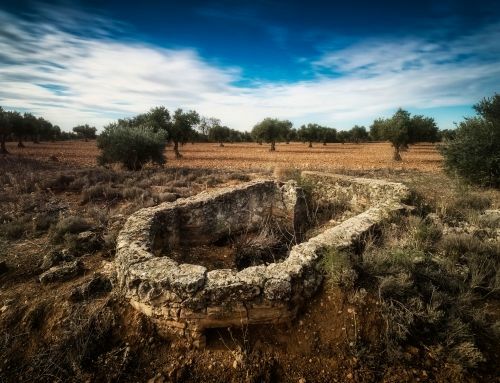 In the following days the attacks and counter-attacks take place in this olive grove maze, turning the struggle into a battle of exhaustion. It will be considered the first modern battle in history due to the participation of battle tanks, artillery and aviation in coordination with the infantry; and the first open field “Great Battle” of war. 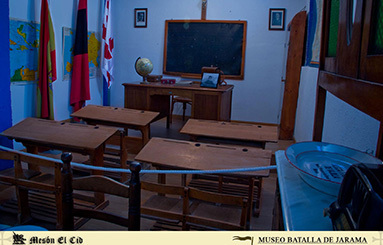 The maximum point of the Francoist advance on Morata takes place on February 16th, with the road cut of the Arganda bridge and the conquest of the Radio House (El Alto) amid a bleeding of casualties. They’re not moving any further. From February 17 onwards, the initiative changes in the battle. There is a changeover in the Republican command, with General Miaja taking charge of the operations, replacing General Pozas. The rebel army is exhausted and has no reserves. They’re going to entrench and try to hold the conquered terrain. 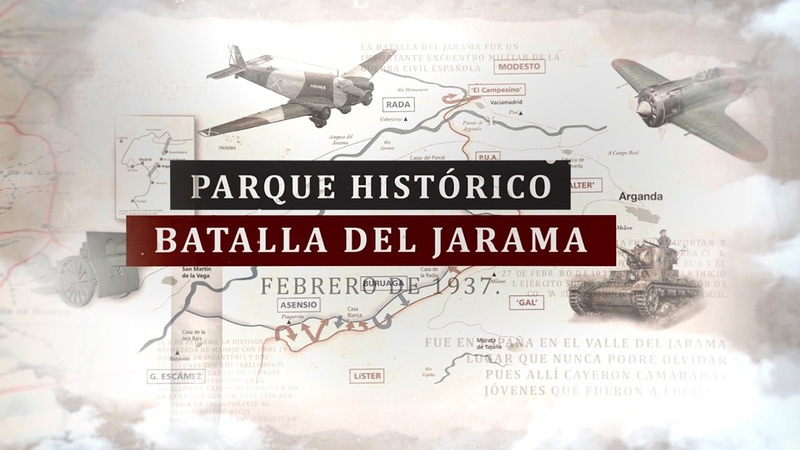 On the contrary, the government army launches a counteroffensive in all fronts with the intention of expelling the rebels to the other side of the Jarama River. The key to this counteroffensive will be the reconquest of Cerro Pingarrón, located in the municipal district of San Martín de la Vega. 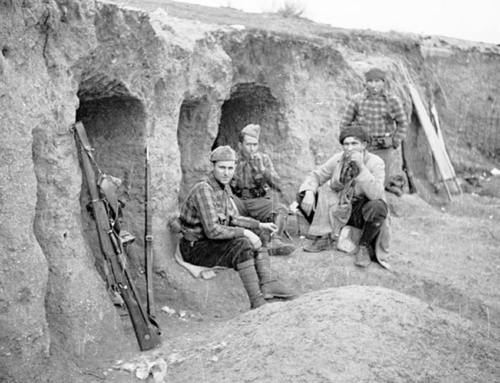 The Republican troops, led by Enrique Líster, head of the 11th Division, are going to throw themselves over and over again against this position. The most critical day will be the 23 February, when as many as three times the Republicans are on the verge of taking the high ground, recognized as one of the bloodiest places in the Civil War. From this day forward, the battle is fading, although there will still be a last and desperate republican attempt to break the front lines. 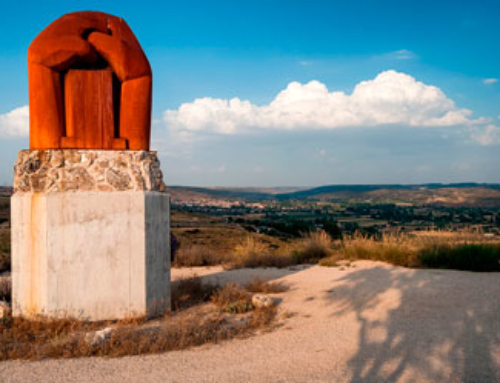 On February 27, beside the San Martín de la Vega highway, the Americans of the Abraham Lincoln battalion and the 24th Mixed Brigade launched themselves against Franco’s positions with a disastrous result. It was the epilogue of one of the most important battles of the Civil War. It made it clear that the war was going to be a long one. The front was stabilized without the two sides having achieved their objectives, remaining almost unchanged until the end of the war, beginning a hard fortifying work that has left our landscape marked with innumerable traces of that conflict. 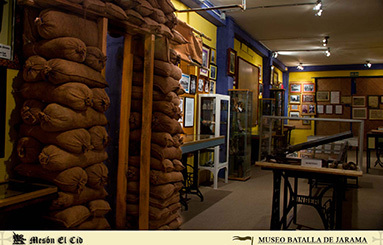 In the town of Morata de Tajuña is located one of the few museums in Spain dedicated to the Spanish Civil War, the Museum of the Battle of Jarama. A time capsule in which you can see hundreds of personal objects, laissez-passer, ration cards, maps, photographs, flyers, helmets crossed by bullets, mortars, leftovers from food cans, lighters, guns, cannons, bottles, periodicals, coins or bills that Gregorio Salcedo rescued from the oblivion of the fields of farmland and olive groves near Mor Morata, in a tribute to those families that, like his own, subsisted in the post-war period thanks to the scrap metal that generated the first modern battle in history. 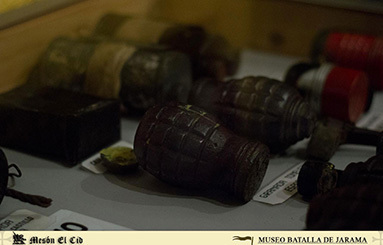 For two decades, these objects, some donated by relatives emotionally linked to the battle and others acquired by Salcedo himself, review the conflict, but not only from a military or ideological point of view, but, more importantly, the life of the thousands of soldiers on both sides who fought from that month of February 1937 until the end of the war. 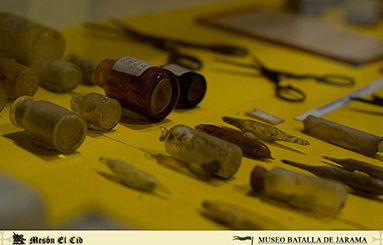 A museum that, as its creator acknowledges,”makes us cry”, but also instructs the new generations about an episode erased from the History of Spain. 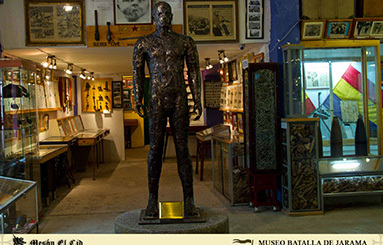 There are eight exhibition halls presided over by the sculpture ‘Tributo desgarrado en metralla del Jarama’ in which the historical value of objects, characters and facts is shown without any ideological pretension. 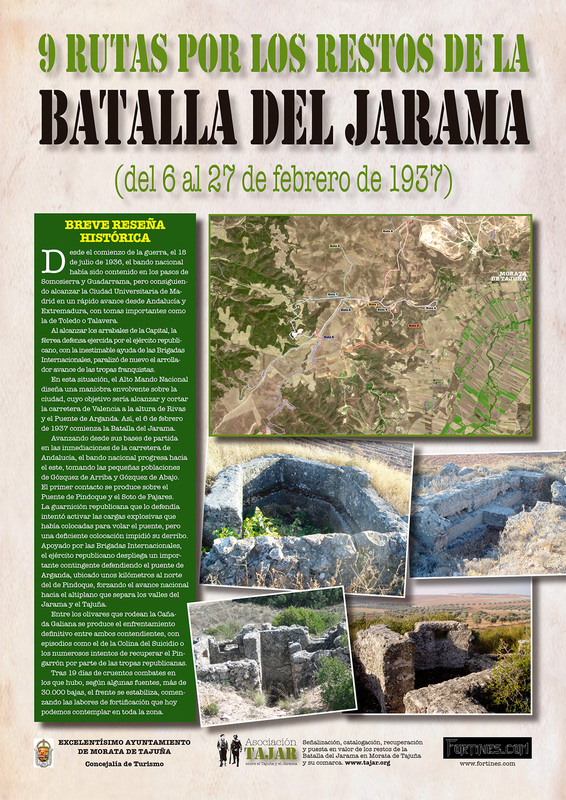 The Historical Park of the Battle of Jarama is an initiative that arises from the municipalities of Arganda del Rey, Morata de Tajuña, San Martín de la Vega and Rivas Vaciamadrid. 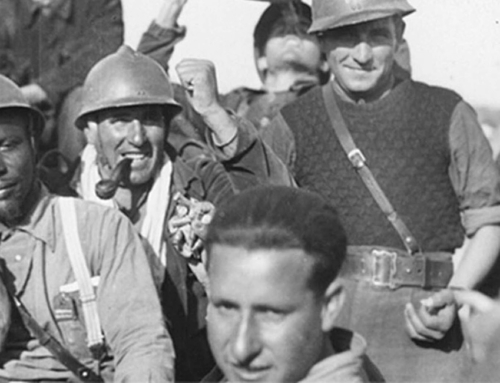 This is a joint project that seeks to disseminate the history of the Spanish Civil War by promoting the heritage resources of the territory from a socio-cultural and environmental perspective and adding other municipalities and institutions in this endeavour. 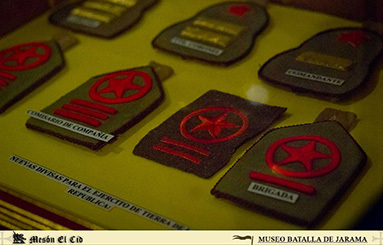 Through different routes it is intended to show the vestiges of a battle that was key during the resistance in Madrid. 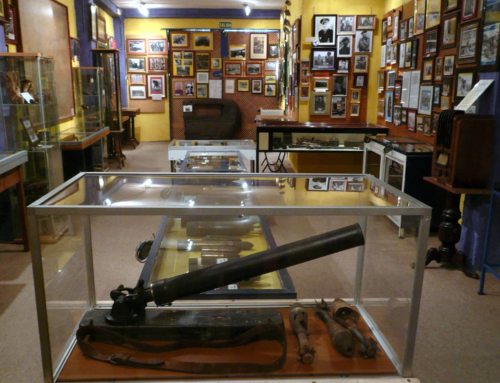 The Historical Park is a very interesting setting for historical, cultural and environmental tourism. The proposed routes are just a sample of the different options that municipalities have been developing through different recovery and promotion projects, in order to guarantee the protection that for the first time established by Law 3/2013, of 18 June, on Historical Heritage of the Community of Madrid on the Fortifications of the Spanish Civil War. In each of the municipalities that make up the Historic Park you will find information on the fortifications and remains, as well as specific dissemination activities organised throughout the year.